These lessons have been developed by Cliff Smyth based on his experience working with people with overuse injuries - also known as repetitive strain injuries or repetitive stress injuries (RSI), carpal tunnel, thoracic outlet syndrome, etc. There are 12 easy-to-do lessons - done either lying on the back or sides, with a couple of lessons in sitting. Most focus on the connection between the arms and the rest of yourself: finding ways to have the support of the legs, pelvis, spine and ribs to reduce the strain for the hands and arms. Some lessons focus on finding greater comfort with fine motor co-ordination of the hands and fingers, and between the eyes and the hands. All have been thoroughly field tested with Cliff's clients and students with repetitive strain injury at the Feldenkrais Center for Movement Education. In designing these lessons Cliff has drawn on his own experience of injury and recovery, as well as 15 years of working with people with hand and arm pain and dysfunction. While these lessons are designed to help prevent hand and arm injuries, used with care, they can also be of great benefit to those who are currently experiencing hand and arm pain. 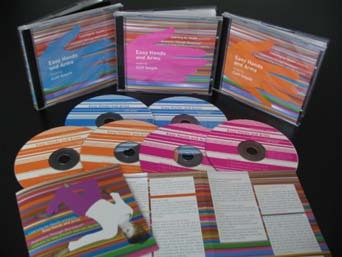 Set includes brief instructional booklet. Circles with elbows & shoulders. For articles by Cliff Smyth on RSI and the Feldenkrais Method go to the Repititive Strain Injury articles page. 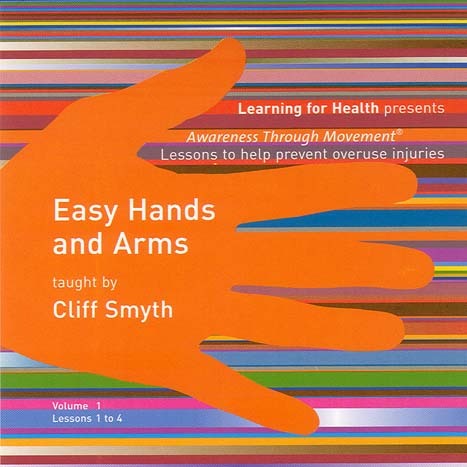 For information about upcoming Easy Hands and Arms public workshops and professional training for Feldenkrais practitioners with Cliff Smyth, please go to our Services page. Click on the link to read about our other CD programs for pain, pelvic floor health, and more. Click on the link to read our articles on chronic pain, pelvic floor health, and more.